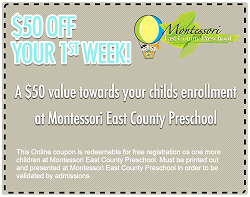 My little boy Ben and I both LOVE Montessori East County Preschool! Highly recommended and five stars! Since I’ve placed my child in this school full-time he’s improved 110%! I would and do recommend this school to anyone and everyone! © 2008-14 Montessori East County Preschool. Website by Internet Gorillas.